In the past two decades, Medical Physics has emerged from small splinter groups of applied physicists to a well-defined scientific discipline. 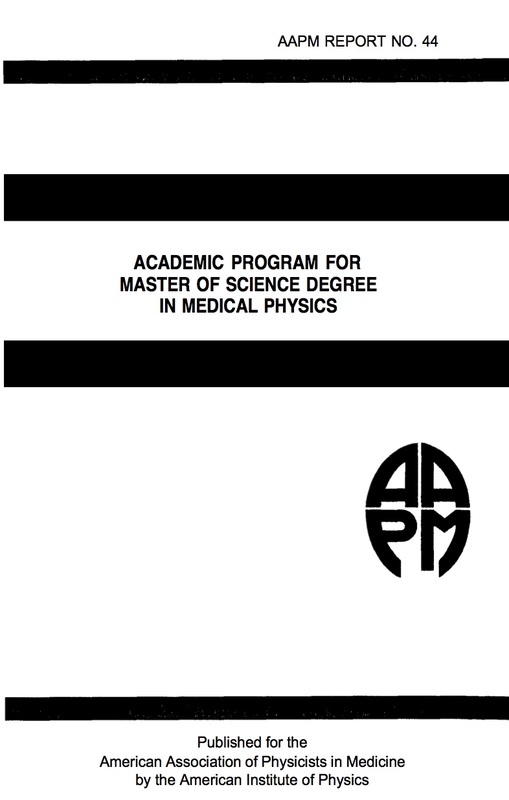 Not unexpectedly, academic programs providing training in Medical Physics were established to meet the monotonically increasing demand for medical physicists. As this discipline has matured, the educational requirements have also become more clearly defined. Existing academic programs contain a core of similarity yet reflect the individual strengths and resources of personnel and facilities. As more programs are created and existing programs seek AAPM accreditation, some guidelines for an academic program are needed. Such an endeavor is fraught with pitfalls, however. Hence this committee has collected a set of topics that provides the minimum level of training an M.S. graduate would be expected to have. By no means is it suggested that the program outlined here is ideal or should be viewed as a satisfactory endpoint. Bather, the proposed program represents a solid foundation to build upon. Beyond these caveats, we anticipate that some of this training might be provided in earlier academic experiences, e.g., a B.S. degree or an M.S. degree in a related field. Obviously, selective admission requirements could implement such criteria. Training is organized into topical areas. Each area is outlined by topics and subtopics. The format is similar to a course outline. This is not to imply that a topical area translates into a one or two semester course format. Rather the integral of all areas indicates the proposed training to be accomplished by some convenient course structure. For some topics, training beyond tutorial contact is through laboratory sequences. These are separately indicated. A bibliography of suggested resources is included. Again, selections are segregated by topical area. Entries are often duplicated as appropriate. A special question concerns “clinical” training. Ultimately a majority of medical physicists practice their training in a clinical environment, most notably in radiation therapy. This situation may eventually lead to “certification” or “licensure.” Without excessive elaboration, formal academic training can never hope to provide nor is it necessarily the proper environment for clinical training. Every attempt is made to provide a foundation 1 for a smooth transition to clinical applications in the suggested program. The final solution to this recurrent problem may reside with a “residency” program similar to the postgraduate training for clinical physicians.